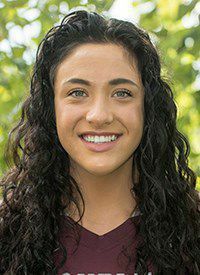 MISSOULA — Hungry for their first February win, the Montana Lady Griz devoured Weber State with a superior inside game Thursday. Four of five UM starters scored in double figures in a 64-56 win over the Wildcats in front of 3,215 fans at Dahlberg Arena. Montana snapped a three-game skid in boosting its record to 11-11 overall, 6-7 in Big Sky Conference play. "We keep talking about we've got a lot of different weapons and we need to spread the ball around more," UM coach Shannon Schweyen said. "I thought the ladies did a nice job turning the ball more and we got contributions from a lot of people." Senior post Jace Henderson paced the Lady Griz with 15 points, hitting 7 of 10 shots from the floor. Gabi Harrington added 13 points and nine rebounds for the hosts and McKenzie Johnston and Sammy Fatkin were right behind her with 12 and 11 points, respectively. "I really thought our girls bought into the concepts our coaches have been talking to us about spacing, turning the ball, when to look at somebody, ball fakes," Henderson said. "There's little details that really make an offense open up. I thought we were really locked in tonight." Neither the Lady Griz nor the Wildcats are especially good from 3-point range. Yet Weber State was willing to launch 25 shots from behind the arc, while Montana was patient and persistent working the ball inside. The result for the Lady Griz was a 38-30 edge in points in the paint and a much better night shooting overall, with UM hitting 48.1 percent of its attempts from the floor (25 for 52) and Weber State 34.9 percent (22 for 63). Still, the game stayed close most of the way. The hero for Montana down the stretch was Emma Stockholm, who finished with eight points and nine rebounds. Montana's lead was 57-53 with just over 2 minutes left when Weber State wasted a chance to draw closer. Emma Stockholm forced a Wildcat turnover by drawing a charge. Then on Weber's next possession, Stockholm made a steal. Stockholm's free throws with 1:12 remaining boosted Montana's lead to 59-53. From there the Lady Griz kept the Wildcats at arm's length with a Johnston bucket, two free throws by Harrington and one by Fatkin. "We had some really key stops," Schweyen said. "(Weber guard Jaiamoni Welch-) Coleman is tough to defend. She's good at getting the hole. It's really hard when she's doing that and kicking back out to girls for threes. "But for the most part our girls were really smart about who they could get off of and help. We had a lot of charges taken and that was a key in the game. When you only win by eight, that's a possession you get." Schweyen saw room for improvement, especially at the free throw line where her team went 10 for 25. But some of that was the result of fatigue, with four of Montana's five starters logging more than 34 minutes. "When you're struggling like that, good teams have to find a way to win," Schweyen said of her team's ability to overcome its free-throw shooting and 18 turnovers. The Lady Griz will try to avenge a January loss at Idaho State on Saturday when they play host to the Bengals. Bill Speltz is the Deputy Sports Editor of the Missoulian. Email him at bill.speltz@406mtsports.com.